Help an angry Argonian take revenge on some Khajiiti pirates. 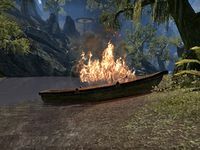 An extremely angry Argonian named Azeenus has asked me to seek vengeance against the Khajiiti pirates in his name. Azeenus wants me to burn boats and kill the pirate captain. Captain Sa'dir sleeps in the rigging of his ship, but he will come running if he hears the storm warning bell. Finishes quest Silent Mire has been avenged. I should find Azeenus by the meditation mound in the village.